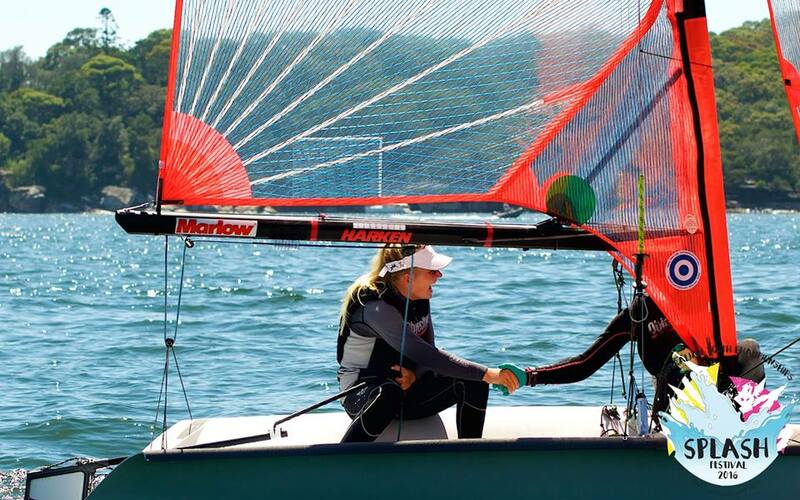 Light airs and long delays threatened an early end to the 2016 Australian Youth Championships, hosted by Woollahra Sailing Club as a part of the SPLASH ('Sail Play Live Across Sydney Harbour' )Festival. The persistence of the Race Management Team and the patience of the sailors saw all but one fleet complete their full racing schedule. The last of the four-day series, held from the 10th to 14th of January, produced fickle conditions and hot temperatures, as a predicted storm front sat off the Sydney Coast. Sailors were lucky to enjoy east-southeast breezes, as the Champions were crowned. With a variety of conditions throughout the week, consistency was the key to success, as sailors competed not only for the national title, but the opportunity to represent Australia at the 2016 ISAF Youth World Championships, in Oman this December. The qualification series involves a three event point score that will be announced following Queensland Youth Week in July this year. The 420 class enjoyed two races yesterday, when an easterly sea-breeze settled on Charlie Course. This allowed RO, Peter Moor to get two consecutive races underway after an initial delay. Nicholas Sharman and James Grogan went in to the day three points clear of their nearest competitor, which was enough to allow the Victorian duo to take the win. In second place in the boys category were a cross-pacific team of Finn Gilbert (NSW) and Henry Haslett (NZ) who achieved a great result after a late decision to join together. The bronze medal went to South Australia’s Matt Meaney and Sam Magarey. The silver medal in the girls category was won by Victorian duo Laura Harding and Eleanor Grimshaw as Sydney locals Charlotte Griffin and Chelsea Connor, took the bronze medal back to their Northern Beaches home. Last year, Angus Calvert’s brother Jock had already secured the Championship title on the penultimate day, but Angus didn’t have the same luxury. It didn’t all go his way this week, with second placed Alex Halank of NSW and Northern Territory’s John Lynch both providing tough competition throughout the week. Calvert completed both races on the last day, in lighter airs than they had seen throughout the week, ‘at 70kg, I’m not really designed for the Bic and had my work cut out for me in the lighter airs,’ said the Tasmanian, who hopes to follow his brothers footsteps and represent Australia at the ISAF Youth Worlds. ‘Having Jock here to see me take the win was awesome, he’s been here all week.’ The pair embraced following the final race – a kodak moment that is sure to grace the Calvert mantelpiece for years to come. The girls category was won by Courtney Schoutrop of Queensland, who will be working hard to beat the boys when Youth Week kicks off in July. Schoutrop will hope to emulate the success of fellow Queenslander, Jo Sterling who qualified Australia for the 2016 Rio Olympics last year. Second place in the girls Bic was Abbey Calvert, who sailed with a 5.8sqm sail showing great tenacity and potential for the years to come. Impressively, second place overall went to the Girls Champions, Natasha Bryant and Annie Wilmot, who challenged the boys crews all week. The pair took one race win and managed to edge out 13 year old Tom Crockett and his crew-mate Tom Grimes, who finished in third place overall, taking a silver medal in the boys category. Unfortunately for the pair, a UFD on the penultimate day saw the girls slip ahead in the overall standings but the boys category silver medal remain their own. Third place in the boys category was won by Ezra Pritchard and Tom Cunich and Queensland. Second place in the girls category was awarded to Annabelle Davies and Hayley Clark from WA with Tasmania’s Jasmin Galbraith and Chloe Fisher taking a bronze medal, after a race win during the week. The Laser Radial class saw the closest final day battle, with the 2015 Laser Radial Youth World Champion, Conor Nicholas trailing New South Welshman Finn Alexander by 1 point. After two tough races in frustrating conditions, Nicholas managed to overcome his rival, as the pair has provided a fantastic duel throughout the Australian Summer regattas. Alexander of NSW took the silver medal, whilst Noah Taylor, representing ACT posted a breakthrough result as he finished in third place. The Laser 4.7 class provides a platform for junior sailors to compete at the AYC, allowing them to see the pathway for International Representation from a young age, gaining experience and contact with their role models along the way. Rome Featherstone of WA took the overall win from club-mate Hayden Coote, as Tasmania’s William Sargent finished third. Japan’s Shione Suganuma won the girls event with Hailey Johnston of WA taking the silver medal and Australian Championship. Morgan Stewart of Victoria finished third. RPAYC Sailors who also participated in Laser 4.7: Nathan Bryant, Antony Hawke, Boston Cortis, Jarrah Sheppard, Will McMillan, and Logan Cortis. Lachie White and Ethan White of Great Lakes Sailing Club in NSW won the Hobie 16 event on the penultimate day, allowing the team to relax on the final day of racing. The pair are not related, but certainly share similar characteristics; an obvious love of sailing, cat racing and competition. They will return to Sydney in just under a month for the Formula 18 National Championships, hoping their experience this week will give them a solid result. In second place were Kyle Fortier and Bonnie Butler of NSW, proving themselves as strong light air contenders. Rounding out a NSW trifecta were Will McKenzie and Pat Butler in third place. The awards night and closing ceremony saw the winners crowned and medals presented by event patron, Michael Fletcher. ‘Fletch’ as he is affectionately known coached many of the event medallists. The patron encouraged sailors to follow their dreams, be kind to their parents and build themselves not only as fantastic sailors but fantastic human beings – the future of our sport. Yachting Australia President Matt Allen and Vice President, Sarah Kenny were present to award prizes and congratulate winners, including Laser 4.7 sailor Daisy Lang who was awarded The Nick Peate Memorial Trophy for her resilience and determination on the race course. Also present were the 2015 Australian Youth Sailing Team who have recently returned from the ISAF Youth World Championships in Malaysia. The team was awarded with the Nations Trophy, which goes to the country that has achieved the highest combined point-score based on top ten race results. Australia last won the trophy in 2007 and the team’s success was inspiring for all – young and young at heart. Matt Allen also awarded the sailors efforts consistency across the Australian Youth Circuit, also acknowledged the Youth Grand Prix Champions and runners up. The coveted ‘Champion State’ trophy was awarded to New South Wales with Victoria announced as the runners up. The predicted Southerly front hit Sydney as the presentation got underway. Although the rain fell, it didn’t dampen the enthusiasm of the competitors, who embraced the carnival atmosphere. The ‘Woollahra Wonderland’ had a photo booth, food trucks and a DJ for entertainment – if the sun came out, there would’ve been jumping castles and mechanical surfboards too! For that, you’ll have to wait until the next time SPLASH and Woollahra host an edition of the AYC. Woollahra Sailing Club hosted the 2016 Australian Youth Sailing Championship as apart of their SPLASH Festival, providing an event ‘for the sailors’. PRO Jeremy Atkinson, RO Peter Moor and RO Robert Lowndes provided a fantastic platform for racing throughout the event and the Jury team, lead by John Middleton ensured fair racing for all competitors. ‘This was an event for the kids - everything was planned around them, from the event gift to the social functions – it was to provide the competitors the best experience possible. The smiles on faces show us that it has been a fantastic success – even though the weather wasn’t perfect at times, it was still a great week. We have a small team from an organisational point of view, but once you include the volunteers, staff, race committees and management, the team grows pretty quickly! Everyone involved made it a special week and we hope everyone remembers the event and their time at SPLASH and the AYC fondly,’ commented Adam South, Woollahra Sailing Club General Manager. The AYC 2016 is hosted by Woollahra Sailing Club as apart of their SPLASH ('Sail Play Live Across Sydney Harbour' )Festival. With over 162 boat and 230 competitors, the AYC is the most prestigious youth sailing regatta within the Asia-Pacific region. The event attracts sailors from around the world and this year hosts sailors from Japan and New Zealand. Racing concluded on the 14th of January, where the 2016 Australian Youth Champions were awarded and the event patron, Michael Fletcher officially closed the event. The 2016 Australian 9er, 420 and I14 National Championships drew to a close yesterday, as the SPLASH Festival hits the halfway point. Woollahra Sailing Club hosted 220 sailors, across five classes, from the 1st to 8th of January with a disrupted racing schedule due to disruptive weather patterns. Each class experienced difficult conditions throughout the week, including torrential rain and excessive winds, which forced the cancellation of racing on the penultimate day. This put pressure on the PROs, Peter Moor (Charlie Course) and Robert Lowndes (Delta Course) to ensure racing went ahead on the last day. Both PROs elected to bring the start time forward leaving the whole day open for potential racing. Like a Hollywood cliché, the sun came out for the final day of racing, as sailors were treated to typical summer conditions. A morning Westerly breeze faded around 10.30am, as both courses postponed racing. With the I14s without a completed series and a below average amount of races for the 49ers and 420s, an increasing East-South Easterly wind filtered down the harbour saving racing and Sydney’s reputation. It was one of the most steady and consistent days of the week, providing sailors an opportunity to stretch their legs as the afternoon wore on. Interestingly, in every class, the winners from the first day maintained their positions throughout the week before being crowned winners at the completion of the racing schedule. Further to that, each of the regatta leaders (eventual winners) suffered their worst form on the last day. With such large point leads the slip in form didn’t effect their positions, but instead allowed learning opportunities ahead of further regattas this year. The 49er class were the first to return to the club after racing and the lighter airs had caught a few sailors off guard, ‘we didn’t have a great day, it was a lot lighter and we were pretty worried about how the day was turning out’ said David Gilmour, the newly crowned Australian 49er Champion. Joel Turner and Tom Signato took two bullets throughout the week and sailed consistently against a strong fleet, taking second place. Local, Harry Price and crewmate, Harry Morton proved their potential taking the bronze medal. The 49erFX Olympic Qualification is ongoing and if this week’s performance is anything to go by, the selection committee have a tough decision to make. The early dominance of Olivia Price and Eliza Solly set them up for their eventual regatta win. However, the second placed crew of Tess Lloyd and Caitlin Elks made their presence clear when they recorded three wins from three races on the fourth day. In third, were youth competitors, Hayden Brown and Mackenzie Bird who will eventually switch to the more powerful men’s 49er Olympic class boat, which share a common hull with the 49erFX class. Earlier in the week, John Cooley and Simon Hoffman suggested they would were here to win- no less. The pair sailed their most impressive regatta to date, only dropping three races throughout the week, leaving them on an overall score of 22, having remained undefeated until the last day of the event. They posted their worst scores of the week (solid results by ‘normal’ standards) before taking the last race win of the regatta. In second place were 13-year-old Tom Crockett and his crew, Tom Grimes who sailed a fantastic regatta – only one placing outside of the 10 due to an OCS in Race 13. Natasha Bryant and Annie Wilmot placed third overall, thirty points clear of the fourth placed team, which earned them first place in the all-girl division. The placing allows Bryant and Wilmot, the ‘Smiling Assassins’, a jump-start on the Australian Youth Team Selection point score, which regatta winners Cooley and Hoffman also achieved. Over on Delta course, the 420s saw multiple race winners throughout the week, but it was the consistency of Simon Grogan and Nicholas Sharman that allowed them to outshine their competitors. Grogan and Sharman dually representing Mornington and Sandringham Yacht Clubs’ are looking towards Australian Youth Team Selection and as this week’s race wins saw leads spanning several minutes, there is potential for them to be at the top of the podium again. In second place were 2015 Sail Sydney Champions, Josh Berry and Henry Haslett who weren’t able to re-produce the form they showed in December. Victoria continued to set the benchmark, with Nick Joel and Hugo Llewelyn taking third place. Not only were Sophie McIntosh and Emily Summerell the best-placed NSW team in fourth place, but also the first-placed all-girl team. Taking away plenty of perpetual trophies and the lead in the Australian Youth Sailing Team selection point score. The I14s were certainly the most relaxed class of the week, enjoying the regatta atmosphere and racing, regardless of the weather. David Hayter and Trent Neighbour lead from the start aboard AUS 666, overcoming the defending Champions Brad Devine and Ian Furlong. Hayter and Neighbour’s confidence began to build after two wins on the first day, which set them up nicely for the week of racing. Western Australians’ Devine and Furlong had to settle for second place, with Chris Vaughn and Matt Balmer head back to Victoria, with bronze medals. The first of the SPLASH Festival events drew to a close last night, as prizes were awarded at an ‘all-in’ presentation. Woollahra Sailing Club and the SPLASH Festival staff organised a ‘Night on the Green’, with a DJ, buffet dinner and relaxed evening on the club grounds. It was fantastic to see all of the sailors celebrate together, regardless of the class they race, the camaraderie is fitting with the spirit of sailing – inclusivity and respect above all. The SPLASH Festival continues with the Australian Youth Championships invitation race tomorrow, the 10th of January with racing scheduled until the 14th of January 2016. The opening day will be followed by four days of competition, where sailors compete for their respective class Championships. 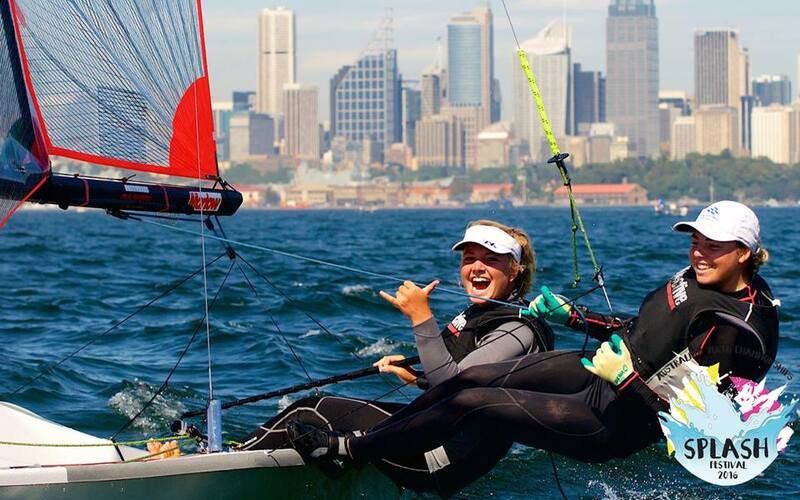 The AYC is also an important qualifier for the Australian Youth Sailing Team.